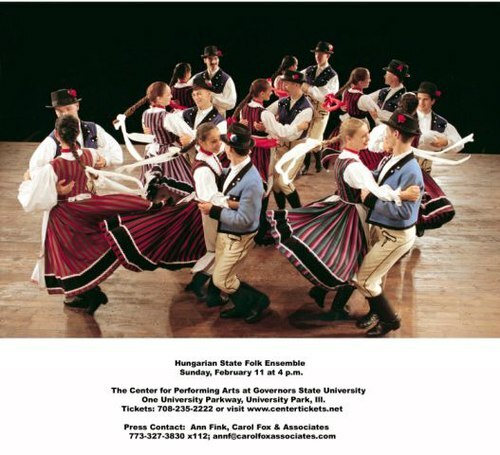 Looking forward to the dance performance of the Hungarian State Folk Ensemble, Sunday, February 11, 4:00 at The Center For Performing Arts, I had the opportunity to speak with Mária Ferencz, the managing director of this vibrant group. S: How would you describe the type of dancing we'll see? M: These are completely original dances and music in a new setting. The music follows Béla Bartók's roots. He was the first to collect tunes that came from our ancestors, our fathers, in villages. 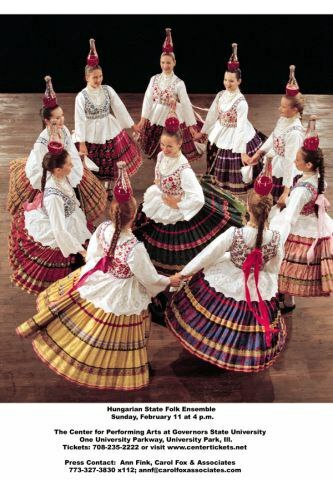 There are no stories in Hungarian folk dancing. It's how our ancestors used to enjoy themselves. There were competitions in dance, among the men, playing violin. We focus on the beauty of the dance. All in all, it's a wonderful joy on stage. S: How are dancers recruited? 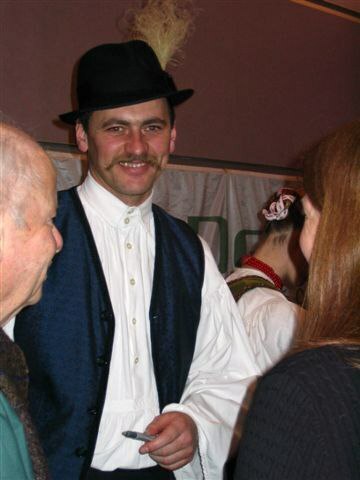 M: The Hungarian Heritage House teaches folklore, music, dance. There's been a huge revival of crafts. They work with children, teachers. There are three special dance schools. 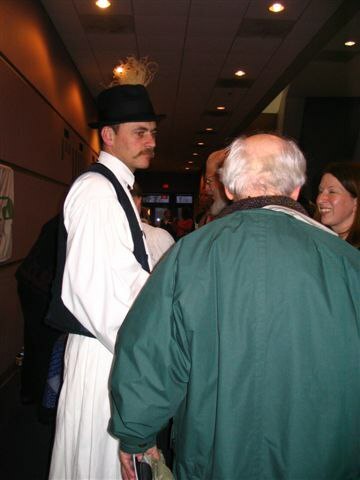 One of the departments teaches trainers to teach folklore dancers. This is where the dancers come from. S: Often the arts struggle for funding. From where do you get your support? M: As our name, Hungarian State Folk Ensemble says, the State subsidizes us. But they would never tell the dancers what to do. The liberty of creating is theirs and then the audiences decide. S: Tell me about your costumes. M: They are made with creative liberty. They hint at the original clothing and copy the way it is made. 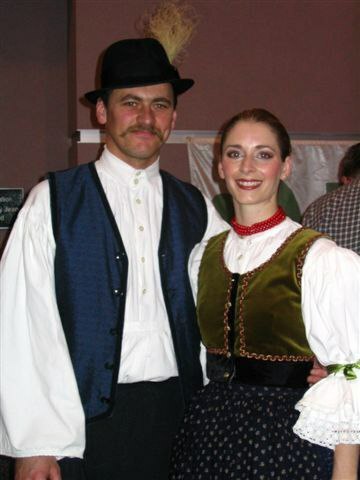 One couple is dancing in original garments, but they are black and white not to distract. S: What are some of the challenges of your tour? M: We started performing January 8 and end April 15. This is a four month tour! We are going several places in Illinois, Indiana, Tennessee, South Carolina, Georgia, Kentucky, Ohio, West Virginia, New Jersey, New York, Florida, and Canada. We are traveling with fifty-two dancers and technicians. This is the first time we'll be gone so long and with such a large group. But everyone's a professional. S: How do you bring "home" with you? M: We have laptops and get email and through the internet we can use a camera and see the person we talk with. S: Any surprises so far? M: The audiences! There is a tremendous understanding on the part of the audiences since we were here (in the States) fifteen years ago. They are very appreciative and understand the message of the creators. S: Help me understand what to look for in your performance. M: Reading the program will help. Also, if anyone just looks at our dancing and is interested, they can understand the message. It is entertainment and part of our culture. As someone wrote, "For a few instants they feel they are Hungarian."